Last week, we covered the beginning of the World War III storyline original featured in G.I. 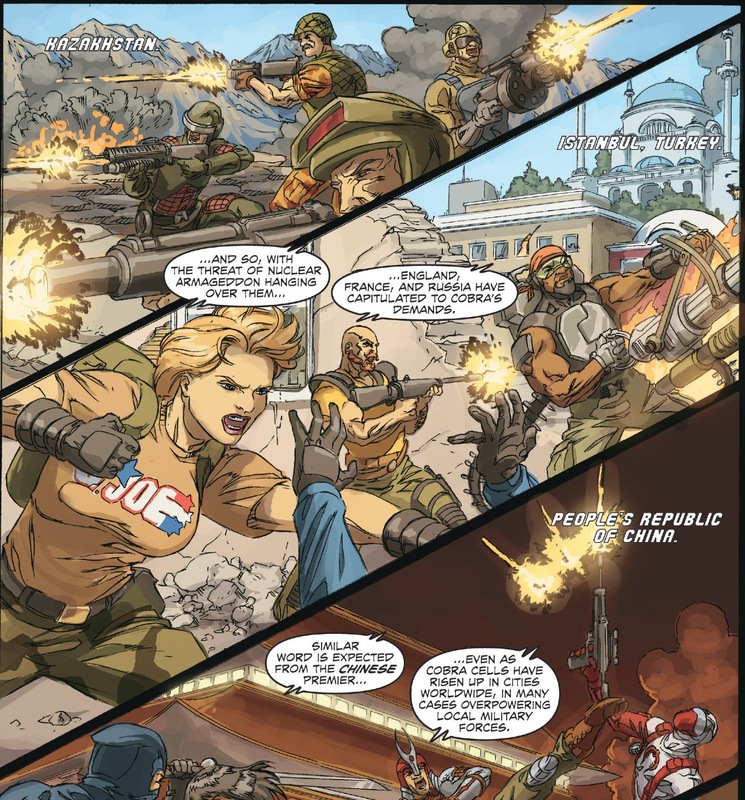 Joe: America’s Elite, written by Mark Powers, with art by Mike Bear, Mike Shoyket, and Pat Quinn. It saw Cobra Commander gain full control of Destro’s M.A.R.S. technology, and then use that to arm extremist groups worldwide. 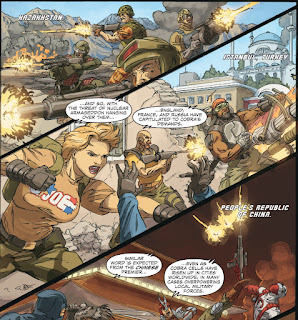 The Joes are spread thin as they try to prevent Cobra’s plans to destabilize governments all across the globe. After a devastating missile attack on the city of Boston, the United States has no choice but to declare war. G.I. 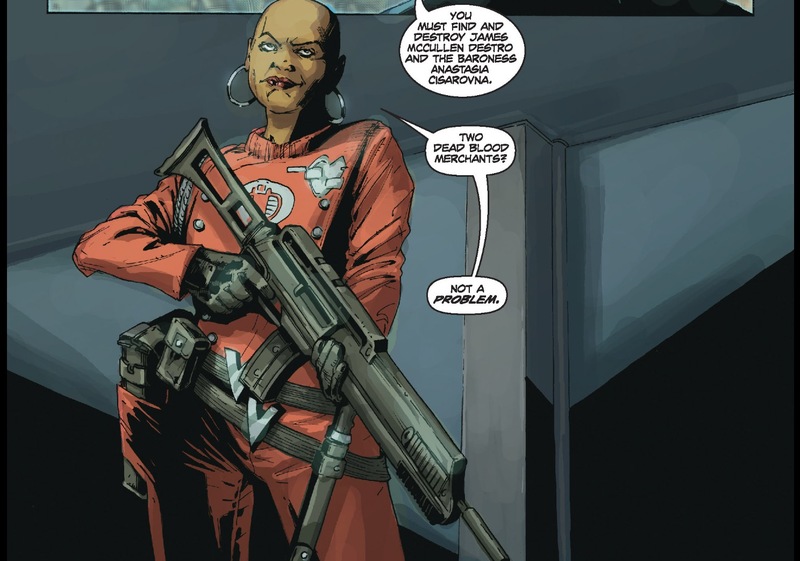 Joe is and always will be Larry Hama, but this is one of the exceptions. The story continues. The world is on the brink of global war after it’s discovered that the missiles that devastated Boston were fired from a Russian submarine. In Jerusalem, Agent Delta neutralizes some Cobra agents before reporting back to G.I. Joe, warning them about Cobra’s plans to assassinate the Prime Minister of Israel. Duke rallies the Joe team to prevent that from happening. In Scotland, Cobra Commander prepares Alexander Destro and his army of Grenadiers for their role in the conflict. The President of the United States is ready to retaliate against the Russians for the Boston attack, but General Colton assures them that Cobra definitely has to be responsible for the attack. 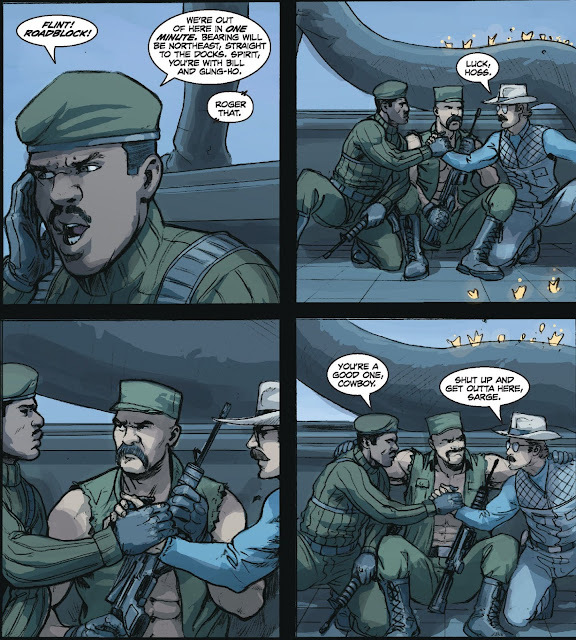 In Chechnya, Falcon and the Oktober Guard have their own problems with M.A.R.S. equipped extremists attacking throughout the city. 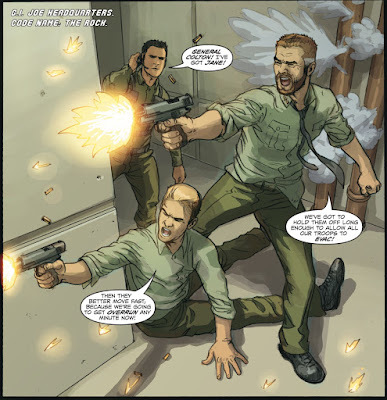 All throughout Jerusalem, the Joes find and neutralize every Cobra soldier, sniper, and agent they can. In the White House, the United States and Russian Presidents are smoothing things over via video feed, when the power goes out. They look outside and shockingly discover that they are being overrun by Cobra. Duke finally meets Agent Delta face to face, and asks him if he’s finally ready to take orders again. With the majority of the nation’s military stretched across the globe, Cobra Commander easily takes the White House, and captures the President. 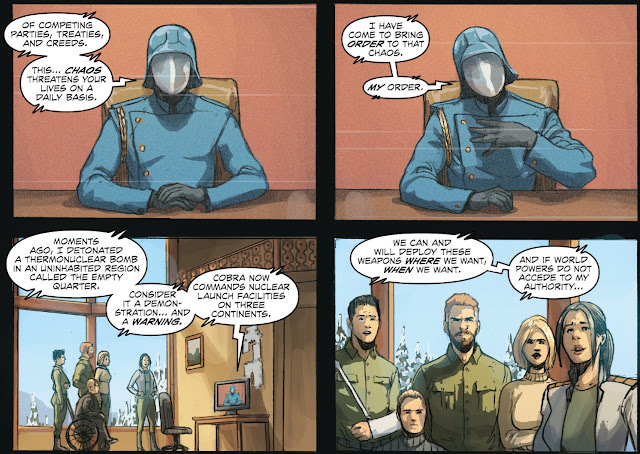 Like I mentioned last week, I love that this is a Cobra Commander that actually knows what he’s doing. Arming extremists across the globe, overstretching the Joes and the U.S. military, all so that the can waltz right into the nation’s capital and take over. That’s just great comics. The Joes continue to remain on high alert, looking for Cobra assassins, as the Prime Minister begins his speech. All hell breaks loose when the Joes lose communications, and Wild Bill is forced to bring in helicopter support. Agent Delta correctly guesses that the assassin must be one of the Prime Minister’s guards, signals the helicopter, and Flint is able to take the Cobra agent out with a rifle shot before he can do any damage. 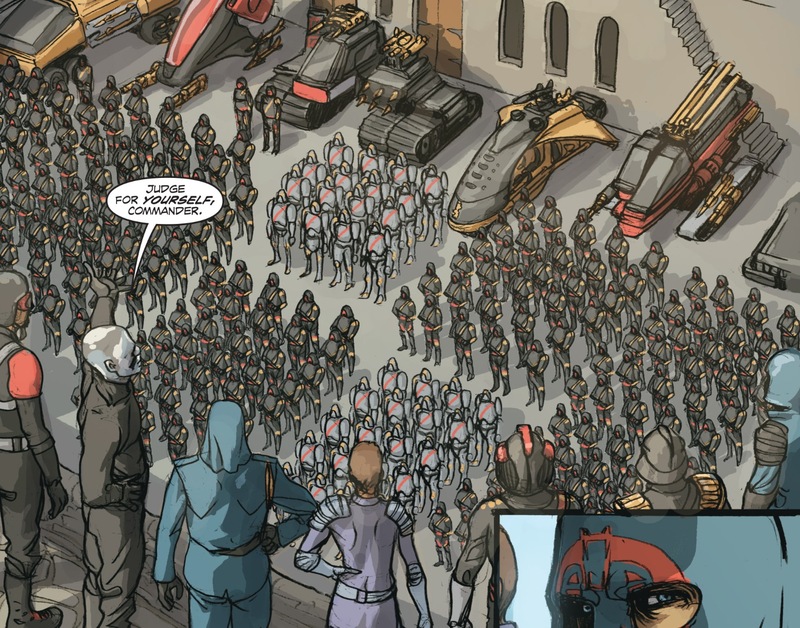 A lot of times in a story of this scale, the heroes end up looking a little incompetent as a result of the villains taking over so thoroughly, but this story does a good job of setting up how outnumbered and overmatched the Joes are. They’re winning the little battles, but keep losing the bigger war. Cobra Commander addresses the country, spouting his rhetoric about the ineffectiveness of the government, and the need for a change. For Cobra to bring order to the nation. His first action will be to respond to the devastating attack made by the Russians. Cobra Commander orders Tomax to go to Greenland and free his brother and other Cobra prisoners from “the Coffin” prison facility. 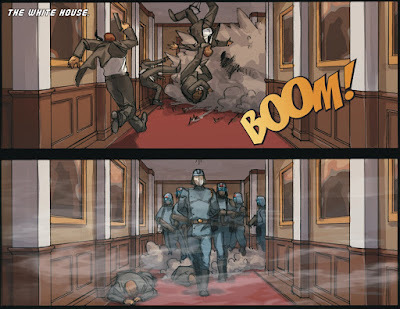 General Colton, Hawk, and Sparks are under attack in Joe headquarters. Sparks catches a bullet to the arm as the three of them desperately try to hold off the Cobra B.A.T.S. untiil the computers are wiped and the facility is evacuated. In Israel, Duke is giving Agent Delta an earful about what he knew, and when he knew it. Delta reminds him that Boston is his hometown, and assures them that he got played along with everyone else. On a road in New Hampshire, Storm Shadow receives a mysterious phone call, with orders to travel to a specific set of coordinates, or else what happened in Boston will seem like a tea party. Look, there’s no way, if you were a child in the ‘80s, that the mere mention of the names Snake Eyes or Storm Shadow does not bring a smile to your face. It’s impossible. In a bunker at Ft. Meade, Cobra Commander looks on as the Russians have launched their missiles at the United States, but a M.A.R.S. satellite easily takes them down. One hour later, U.S. officials contact the Russian President and admonish him for firing on them. The Russian President defends his move, saying that Cobra is already attacking Moscow, and he needed to try and eliminate Cobra Commander’s access to the U.S. nuclear arsenal. The Vice President tries to convince Russia that attacking each other is exactly what Cobra wants, and that they’re convinced Cobra has undercover agents in their government, business, and the media. The Russian President responds that if the U.S. has been infiltrated, then Russia certainly has as well. In Saratov, Russia, Falcon and Vorona are arguing with Russian border agents for not allowing them to cross and assist in rescue efforts in Moscow. The Oktober Guard sneak up on the agents and take them out, convinced they are Cobra traitors. Back in Israel, the outnumbered Joe team engages the Cobra Plague team. In London, the British government is pledging their full support of the United States in a televised press conference, when Alexander Destro and his army attack. At the Coffin in Greenland, Storm Shadow arrives too late, the prison has already been attacked. He soon finds himself surrounded by red ninjas. He slowly but surely takes them out, as he thinks to himself that this is the ultimate battle that he and his sword brother (Snake Eyes) always knew would come, and this time they fight on the same side. Like I’ve said before, I didn’t read the Joe comics as a kid, so I never knew that Storm Shadow was working deep undercover in Cobra all along. 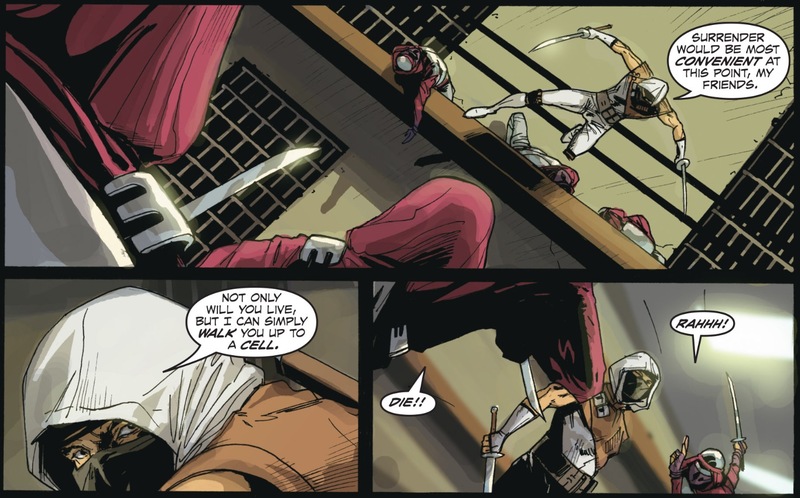 The thought of Snake Eyes and Storm Shadow being best sword buddies just sends my heart all a flutter. The Joes are fighting off the Cobra soldiers as best they can, but the numbers are too lopsided. Duke orders them to split up into separate teams, so they can lessen the impact of Cobra’s superior numbers. Agent Delta reveals his real name to Duke, Lorcan Rourke. Turns out the Rourke that was hired to assassinate the Israeli Prime Minister that was covered last week, is Agent Delta. I wasn’t paying enough attention I guess. That’s why you come to me, for half-assed analysis. Hey, you get what you pay for. Tomax locates Major Bludd’s prison cell and sets him free. 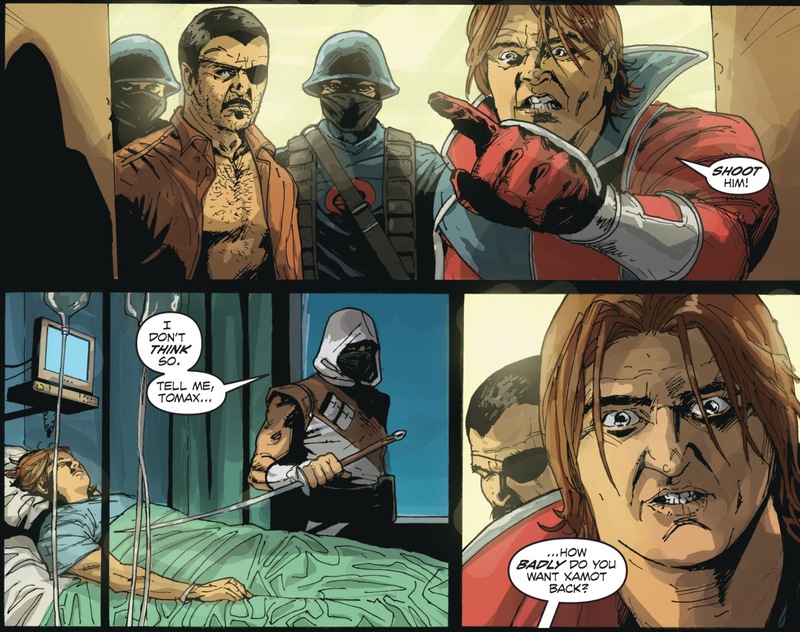 Storm Shadow addresses them over the loudspeakers, and tells Tomax that if he values his brother’s life, they’ll meet him in the medical ward. 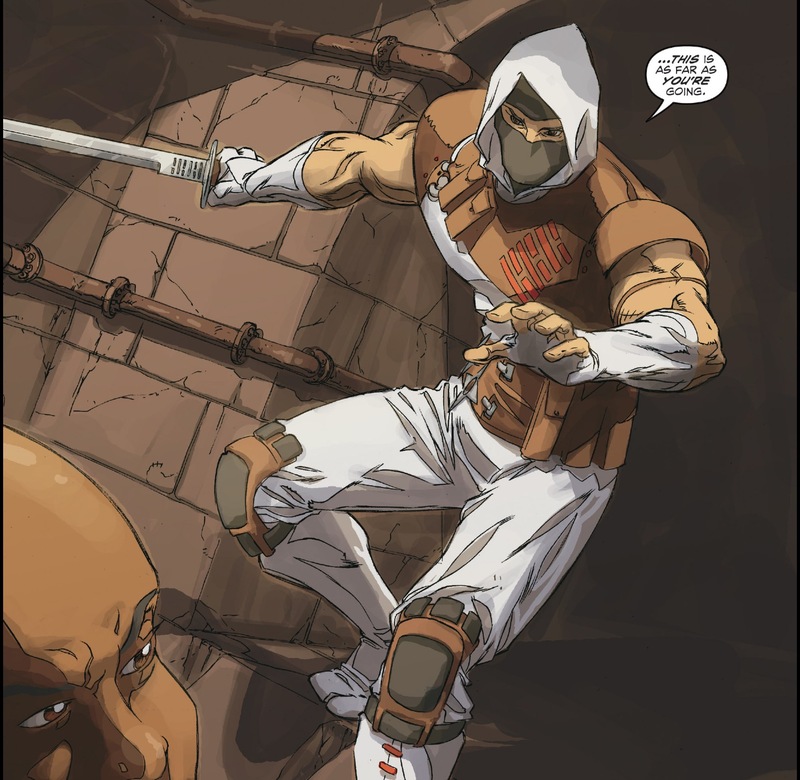 Storm Shadow offers Tomax a deal. He’ll spare his brother’s life, as long as not one more prisoner goes free today. Tomax accepts the deal, collects his brother, and leaves. After they’ve left, Storm Shadow addresses a figure shrouded in shadow. He’s not happy about letting Bludd go free so soon after his capture. The shadowy figure is revealed as an undercover Cobra soldier. He hands Storm Shadow a disc containing valuable intel, and assures him that they will capture Bludd again. In a helicopter flying over a desert in the Middle East, Cobra Commander talks to the U.S. President. All around the world, Cobra forces are attacking and winning. Colombia, North Korea, Russia, and China. The helicopter lands, and Cobra Commander pushes the President out into the barren wasteland. Rourke Flashes back to a time when he had completely bought into the Cobra vision. He believed Cobra Commander was going to change the world. In Ft. Meade, Cobra Commander tries to convince a prisoner freed from the Coffin (one that formerly tried to assassinate him) to work for him. If this woman, Dela Eden, truly wants to see the world’s corrupt leaders brought low, she needs to work with Cobra. In Malta, the remaining Joe members that split off from Duke and Rourke rest for a moment, having momentarily lost Cobra’s elite Plague unit. 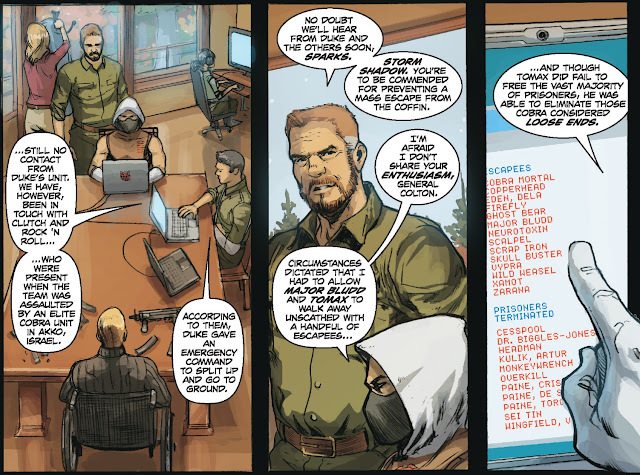 In Priest Lake, Idaho, General Colton, Hawk, and Sparks, get Storm Shadow’s update from the Coffin prison break. 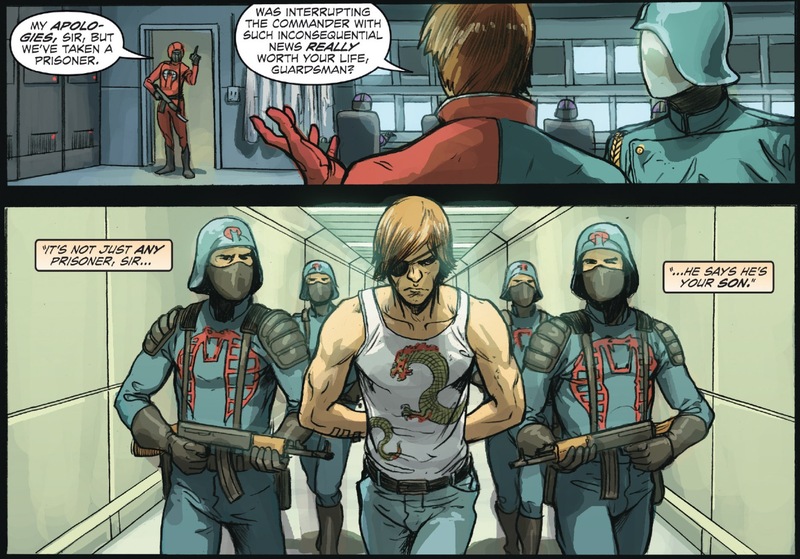 Cobra was able to free many of its high level operatives, as well as terminate a bunch of loose ends. 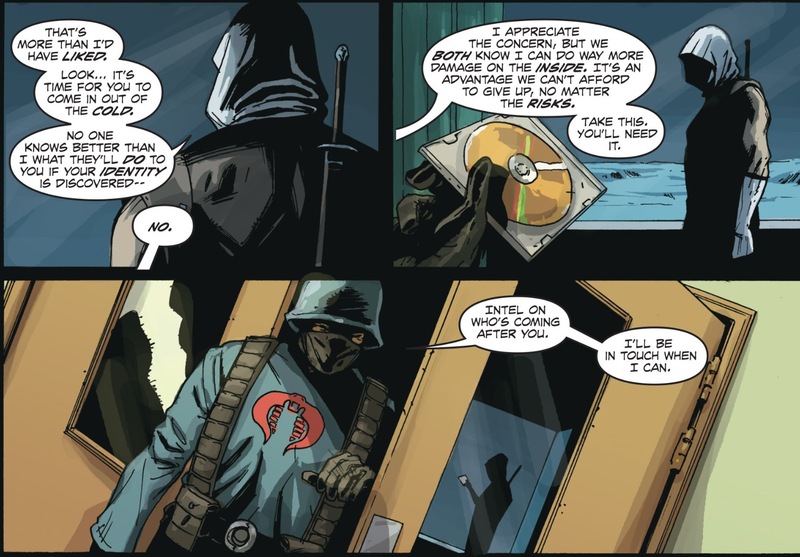 Fortunately, Storm Shadow was able to obtain a disc that contains important intel on Cobra’s elite Plague unit. Unfortunately, Cobra’s access to the M.A.R.S. tech gives them a distinct advantage over the rest of the world. Only two people in the world might be able to counteract it: Destro and the Baroness. In Malta, the Plague have found the Joes and once again engage in a full assault. 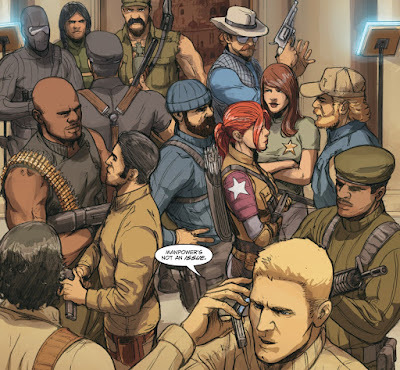 The Joes teams split up again, with Snake Eyes and Scarlett disappearing into the night. In Miami, Florida, the Dreadnoks have moved into town, and claimed it as theirs. However, Zartan doubts that they are a part of Cobra Commander’s long term plans. In England, Alexander Destro has taken the Parliament building, and captured the Queen. In Malta, Stalker orders Gung-Ho and Wild Bill to retreat while he covers their escape. Wild Bill disagrees, believing that with military and civilian leadership in disarray stateside, that they’ll need someone like Stalker far more than they’ll need someone like himself. Stalker reluctantly agrees, and bugs out with Roadblock and Flint, leaving Wild Bill, Gung-Ho, and Spirit behind. In a deserted wasteland known as the Empty Quarter, General Rey and a team of U.S. soldiers overrun a Cobra outpost. All over the world, the Joes valiantly try to hold back the tide of attacking Cobra soldiers. Bolivia, England, Georgia (the country), and Madrid. In Ft. Meade, Cobra Commander knows that the Joes will try to take M.A.R.S. away from him, reducing his advantage. 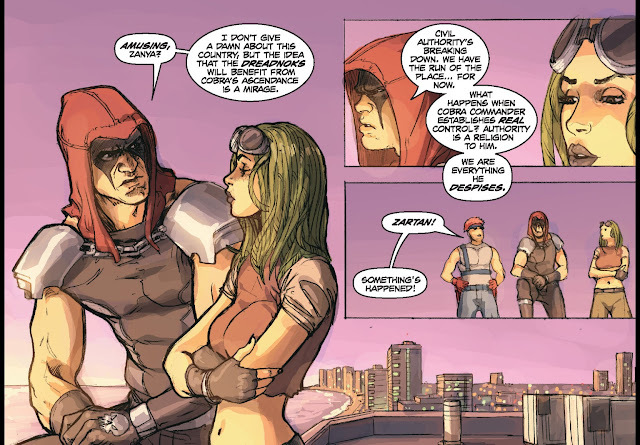 That is why he is sending Dela Eden to find and kill Destro and the Baroness. Rourke and Duke arrive in the waters of New York City, covertly enter the city underwater, and then navigate the empty subway systems to Rockefeller Center, only to find it overrun by Cobra. In England, a British officer makes one last ditch attempt to destroy the nuclear codes before Cobra can obtain them, but his partner betrays him, revealing himself as a Cobra ally. In Idaho, General Colton asks Sparks if he’s had any luck making contact with any of the Joe teams. Unfortunately Cobra has control of the NSA and any means of electronic communication. The Joe teams are on their own. In a plane high above the Czech Republic, Storm Shadow parachutes out, on a mission to locate Destro and the Baroness. In Malta, Gung-Ho, Wild Bill, and Spirit are being overwhelmed by the Plague’s superior numbers. In the Empty Quarter, General Rey is interrogating a Cobra soldier, when they hear an explosion, and look outside to see a familiar-looking mushroom cloud off in the distance. Cobra Commander addresses the world. He informs everyone that he has detonated a thermonuclear bomb in the Empty Quarter, as a demonstration of power. Cobra now controls nuclear launch facilities on three continents. If world governments do not cede authority to Cobra, he can deploy these when and where he wants, starting with populated areas. It’s always seemed like a pretty ridiculous goal for any cartoon or comic book villain to believe they can take over the world, but this story has done a pretty convincing job of making it seem possible. This plan of Cobra Commander’s keeps looking more and more impressive. In Malta, Wild Bill, Gung-Ho, and Spirit make what looks to be a suicide run, getting buried under tons of concrete after the Plague fire a bazooka at them. Before they can confirm the kill, the Plague are called back to New York. In Ft. Bragg, the Speaker of the House and the Vice President debate if they should cede power to Cobra. 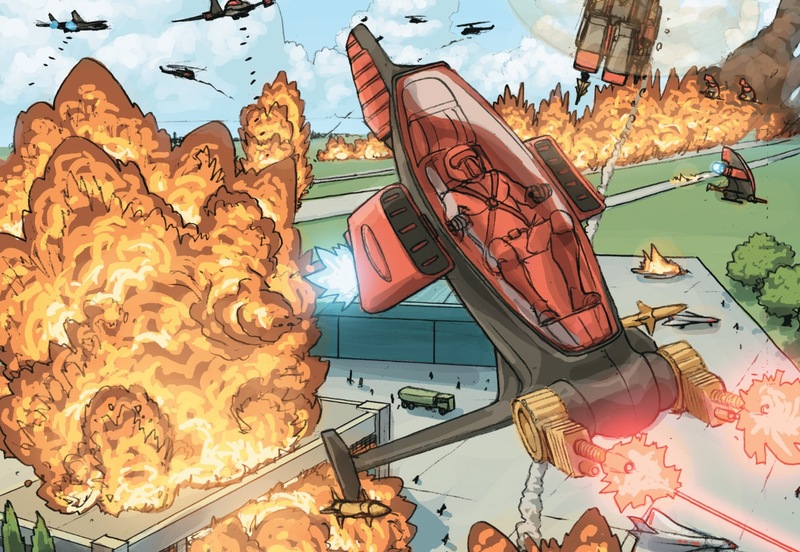 Even if they had the complete control of their military arsenal, Cobra has no singular base of operations, and no need to occupy large areas. (This is actually what makes the “War on Terror” in the real world such a difficult conflict. It isn’t like fighting a war against another country, with an established location and uniform, and more traditional tactics. Terrorists are fractured and mobile, can look like anyone, and can strike from anywhere.) They make the decision to relinquish power, and leave the fate of the country in the hands of the soldiers in the field. Shipwreck and Cover Girl arrive on a Joe aircraft carrier in the North Atlantic, just in time to see Airborne and other Joes leave to provide air support to England and France. Alexander Destro and his army of Grenadiers are very close to taking Paris, when Airborne and a squadron of fighter jets arrive. Unfortunately, they are surprised by cloaked M.A.R.S. aircraft. In Prague, Dela Eden is interrogating and torturing a friend of the Baroness, Dusan, when Storm Shadow intervenes. 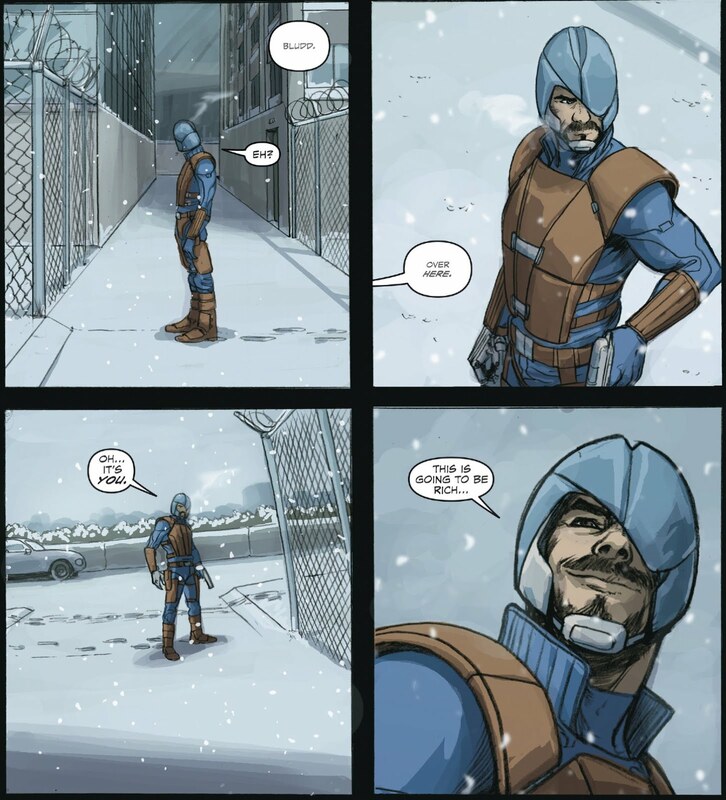 At Ft. Meade, Major Bludd is outside in the snow when he hears a voice, and turns to see someone he recognizes. That shot of him standing alone in the snow really jumped out at me. I’ve always been a fan of the way extreme weather can really enhance a scene. It also reminds me of the time I was in Korea during a military combat exercise. We were supposed to evacuate our building and relocate to our backup facility. As we’re running outside, the snow is coming down hard, and the entire ground was covered in white. It was awesome. I got more than a little pumped, and it felt like I was a real actual soldier for once. I watch way too many movies. Once again, Joe soldiers continue to fight all across the planet, including Kazakhstan, Turkey, China, and Ireland. Yet, with the threat of nuclear Armageddon hanging over them, the governments of England, France, and Russia have capitulated to Cobra demands. In Ft. Meade, Tomax asks Cobra Commander how he plans to bring all this conflict to a permanent end, but Cobra Commander does not want it to end. His goal is a world of perpetual war. They are interrupted by a Crimson Guardsman with news that they have taken a prisoner. They have captured Cobra Commander’s son, Billy. Longtime G.I. Joe comic readers will recognize Billy from Larry Hama’s legendary run on the Marvel series. Billy was the son of Cobra Commander that eventually became a member of the Arashikage ninja clan, and an ally of Snake Eyes and Storm Shadow. It looks very much like Cobra has won. Come back next week for the stunning conclusion.